Chattanooga’s Southside is a bustling neighborhood that’s teeming with art, shopping, and culinary experiences that are unlike anything else in the city. From restaurants with classic Southern fare to Thai bistros to late-night dive bars, there’s something for everyone to enjoy as you explore the Southside’s growing food scene. Everyone knows that breakfast is the most important meal of the day, and there’s no shortage of good coffee and fresh biscuits to be found on the Southside. Frothy Monkey, located in the recently renovated Chattanooga Choo Choo complex, is serving up a full breakfast and brunch menu every day until 5 p.m. Their menu has a variety of bagels, breakfast sandwiches, and options for vegetarians, kids, and those with special dietary needs. Just down Main Street, Mean Mug is another local favorite. Their coffee is locally roasted and the breakfast menu includes one of the best buttermilk biscuits in the state according to USA Today. A day of exploring the Southside’s Sculpture Fields at Montague Park or enjoying a tour at Songbirds Guitar Museum is a great way to work up an appetite. If you’re in the mood for a burger, a visit to Urban Stack is a must. They’re serving up specialty stacks like the Philly Cheesesteak burger, North Carolina Chili Cheeseburger, and the Asian Q which features kimchi and wasabi slaw. If you’re feeling full after lunch, enjoy a walk around the Main Terrain Art Park before your next stop. Although we think that breakfast is the most important meal of the day, dinner comes in at a close second. Chattanooga’s culinary scene shines during the dinner service, especially on the Southside. At Alleia, Chef Daniel Lindley has created a unique, rustic Italian menu with dishes like butternut squash ravioli, pork belly gnocchi, and brick oven pizzas. Just down the street you’ll find Main Street Meats, which is owned and operated by Easy Bistro’s Chef Erik Niel and Amanda Niel. The neighborhood butcher shop specializes in all things meat from porterhouse steaks, beef tartare, and an out-of-this-world pastrami sandwich. If you’re not quite feeling breakfast or lunch, brunch is a great way to get the best of both worlds. Sunday mornings can be tough, but Hi-Fi Clyde&apos;s has a brunch that will fix you right up. This Southside dive bar has a stacked unique menu with items like the Sunday Funday Torta, a fried chicken biscuit, and a brisket stuffed potato that aims to please. If a simpler brunch menu is for you, the FEED Co. Table and Tavern is serving up strawberry pancakes, biscuits and gravy, and corned beef hash. Both restaurants offer full lunch and dinner menus that are definitely worth coming back for. Our guide to the Southside wouldn’t be complete without tips on where to quench your thirst with a crafty cocktail or cold brew. The Flying Squirrel has a long list of cocktails that are made with their own infusions and a beer selection that rotates frequently. They strive to keep things innovative and interesting and sometimes that includes bringing in beers that have never even been tapped in this state. At STIR, bartending is considered a form of art. Each cocktail is crafted with a unique selection of artisanal ice that has been hand-cut by STIR’s in-house ice chef. With over 350 spirits to choose from, fresh-pressed juices, and locally made bitters and syrups, the perfect cocktail is just a sip away. If you&apos;re looking to satisfy that sweet tooth, you&apos;re in good hands on the Southside. As most people know, no visit to Chattanooga is complete without a stop into Clumpies Ice Cream Co. 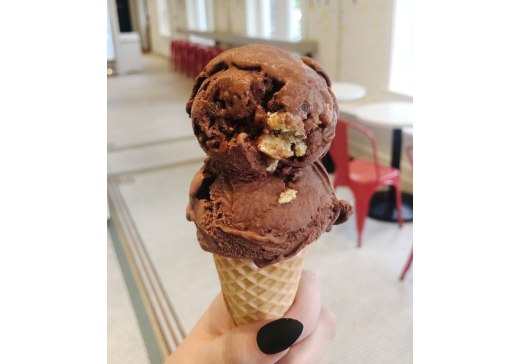 In 2018, Clumpies opened their fourth scoop shop on Chattanooga&apos;s Southside. The newest shop features the same classic ice cream flavors like Coffee Toffee, Cookies & Cream, and Coconut Almond Chunk, but you&apos;ll also find a variety of rotating seasonal flavors. Time your trip to try Nutella Crunch (spring), Salted Watermelon (summer), or Campfire (fall). Just across the street from the Chattanooga Choo Choo, you&apos;ll find handmade chocolates, truffles, pastries, and more at The Hot Chocolatier. Sip on one of their specialty hot chocolates or cool down with a frozen hot chocolate in the summer. Now that you know how to navigate the Southside food scene, get out there and EAT! And if you’re a true foodie, be sure to snap a before photo of your food or drinks to share. Just be sure to use the hashtag #ChattanoogaFun so we can see your Southside adventures, too!